This group of fabrics intrigues me. Some of them could easily go into the New York Beauty blocks while two of the others would go well with the first group of fabrics shown on Monday. Or I could keep them together as a group and see what I can come up with as far as a design goes. Sometimes just having a group like this out where I can see them will be all it takes to come up with an idea. I’m not deciding that now as I am trying not to start anything new until I get at least two of the tops that are in progress finished. The operative word in that sentence being trying. The headache was hanging on all of yesterday so the Pickled Ladies didn’t progress. Hopefully it will be gone and I’ll be back to work on them today. 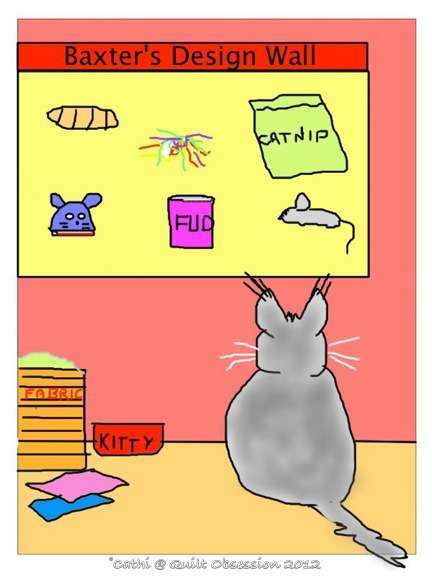 A kitty version of a design wall is today’s Baxtertoon. 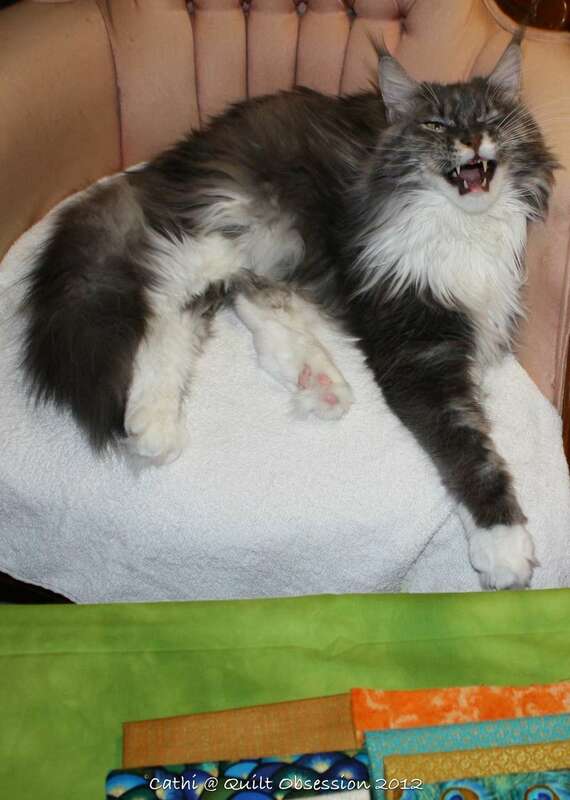 We caught Baxter in the middle of — is it a yawn or is a roar? Love the4 peacock feather fabric! Can’t wait to see what you decide to do with the group! I hope that headache vanishes soon…no fun at all! What an interesting collection of fabrics! Hope your headache leaves you alone. I don’t think Baxter is yawning or growling, I think he’s smiling……and why not, he lives such a good life. I know my kitties would love a design wall just like Baxter’s! 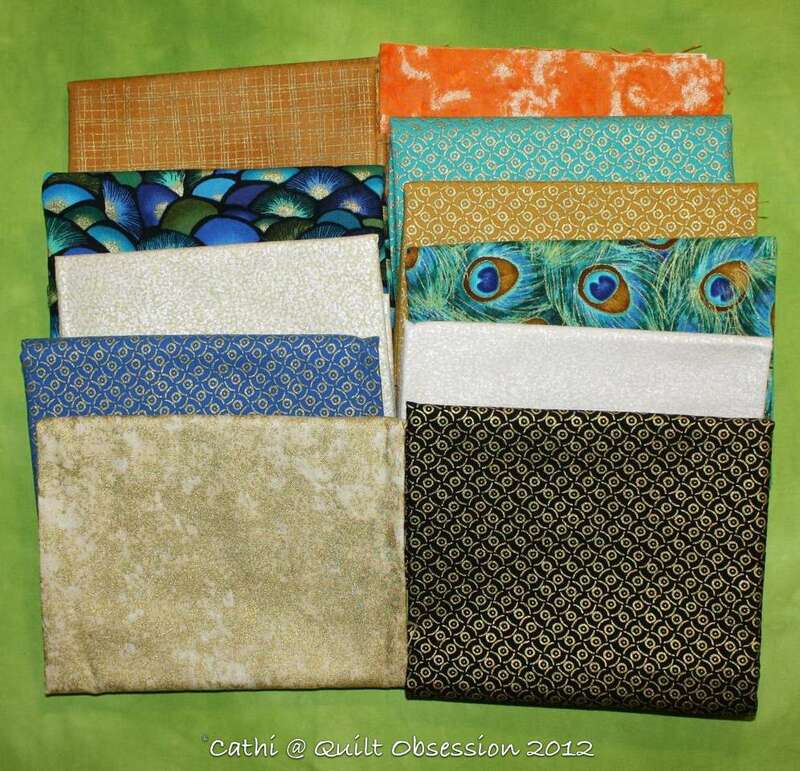 I like the aqua and orange fabrics! I love Baxter’s design wall. I think he is trying to tell you in that picture, which of the fabrics he likes or doesn’t like as he is sort of pointing to them. I am so glad your headache is now better Cathi. I can’t wait to see what you do with these fabrics. Please tell Mr. Q.O. that he has outdone himself with the Baxtertoon! A kitty design wall–how clever and adorable!! Baxter looks ferocious (or sleepy).